Giza 45 is the most highly graded cotton fibre of the Egyptian cottons. It is the longest, thinnest, strongest and most has the best uniformity index of 88.5 of the ‘Giza’ grade cottons. Meaning the irregularities are minimal, therefore producing a very smooth and silky look and feel when woven into fabric. What are the other Giza cottons? Long staple fibres - This includes Giza 86, Giza 89 and Giza 90. This first family is when the fibre is longer than 33mm and has a fibre diameter of 4.3 to 4.9. It is very high quality cotton, which is slightly better than the well-known American brand of ‘Supima’ cotton. Extra-long staple fibres - The second group includes: Giza 87, Giza 88, Giza 45. To be graded as one of these 3 premium Giza qualities the fibres must be fine yarn diameter with high uniformity index. The Giza 45 is the best among its Giza counterparts and is rated at 2.95 micronaire (uniformity index). What makes Giza 45 the best? Giza 45 is undeniably the best cotton in the world. It has to do with a number of factors that ultimately combine to produce the finest cotton products. As previously mentioned Giza 45 falls into extra-long category with a superior fibre. In addition to this and equally important, is the fineness (2.95 micronaire) and unmatched uniformity. These 3 properties alone are outstanding when combined to create a very fine and smooth hand feel, and also allow a naturally high thread count without the use of plied yarns. Strength - Adding to the superior properties is a very high breaking resistance, measured at an average of 44.3 g/tex. This means despite it’s fineness the yarn is likely to produce one of the strongest fabrics when woven. Cleanliness – Due to the special attention the Giza 45 is cultivated with it is generally a much cleaner cotton when harvested from the plants. Natural cleanliness has two benefits. The first is that there will be less brushing of the fibres, therefore keeping the natural structure of the fibres intact, creating less ‘ends’. The second benefiting factor is that less chemicals (similar to bleach) will be used to make the cotton ‘white’. These bleaching chemicals tends to break down the strength of the cotton, therefore leaving cotton weakened and damaged. Hand Harvesting – The Giza 45 is such a unique grade of cotton that it is exclusively harvested by hand, for the best chance at preserving the cotton. It’s obvious why, as you can imagine the damage the blades of the machinery would do to cotton as its being picked. This laborious and time consuming process adds to the cost of the raw cotton, but ensures the highest quality product. Maturity – The maturity of the cotton is carefully selected while being hand harvested. It is another reason the Egyptians prefer to harvest by hand, so they can visually analyse the maturity of the cotton before picking it. A more mature cotton produces the longer staple fibres with the greatest strength. Hand Combing –The elimination of irregular and inferior particles is all done by hand. Piece by piece the cotton is sifted through in what is known to the Egyptians as the ‘farfara’ method. After the sifting and excluding the irregularities, it takes careful and skilful techniques to really make the most of the extra-long staple fibres. Specialty spinners are employed to create the world’s best yarn. Giza 45 is grown in Egypt, the home of the real Egyptian cotton. The specific area is on the Nile Delta is the most fertile area of Egypt where rain, sun, humidity and soil combine to produce a climatic perfection. These perfect conditions result in Giza 45, the best cotton in the world. The region in which the Giza 45 is grown is ideal proximity to the Nile, which acts as a natural irrigation system to the cotton plantation. 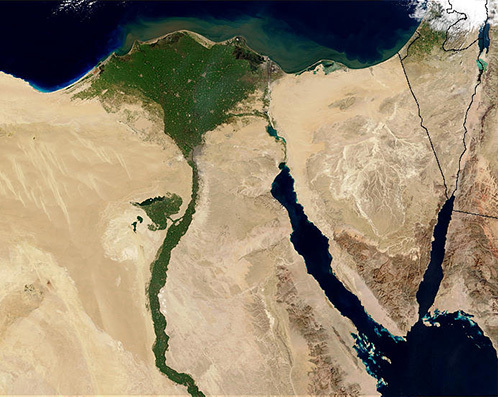 It is nestled in a triangle in a fork in the Nile itself and is a contrastingly lush area of Egypt (this can be seen in the satellite image, taken from orbit above Egypt). This ensures the harvest will never be short of hydration, and keeps the soil’s moisture content at a consistent level. As well as this the average rainfall is 190mm in the six months from October to April, this is a supply of clean fresh water that hydrates the crops from above in a few short bursts of torrential rain. Additionally, the humidity is constant at approximately 60%-70% throughout the growing season. The geographical position, which is close by the sea means the average temperature doesn’t vary much from one day to the other due to the sea winds cooling down the dessert air. Why Is Giza 45 so expensive? Because the Giza 45 is grown in such a small region, only a certain yield can be produced each year. Meaning the cotton is rare. Giza 45 has a high demand and sometimes all orders cannot be fulfilled. And when the demand exceeds the supply the price is pushed up. As well as being rare, the extra manual processes and methods quickly add to the cost of the raw Giza 45 cotton. On average, the raw cotton is 5 times the cost of regular Egyptian cotton. And that's before it is even woven!